Summer 1914, the whole of Europe is falling deep into the Chaos of war, a conflict unknown by its new nature; a gigantic, brutal conflict involving millions of men fighting a senseless war. Soon, iron will rain heavily and the corn fields of Western Europe will be flowing in blood. On this day, the most wonderful summer of the century will turn into Hell. From the small Belgian towns to the large fields of the east of France, passing by the narrow streets of Ypres, relive the year when the old world died for a new one, which changed everything. Which side will you choose ? Will you fight for The Triple Entente to defend Belgium and France against the German appetite for new territories to conquer? Or for the German Empire to exert it's full power over the old continent? 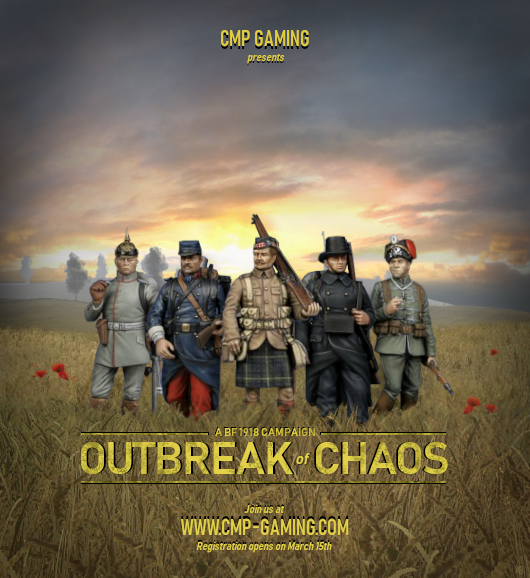 Whichever side you fight for, join us in our new Battlefield 1918: Outbreak of Chaos. What is a campaign? A campaign is a series of connected battles, where we recreate the timeline of the war. Campaigns are played over 8-10 weeks and every Saturday we will have a 3-hour battle with multiple rounds. All battles are counted towards the final score which determines the army that won the overall campaign. Battles will take place every Saturday evenings at 18:00 UTC.